Lucy Dakin of City of Peterborough Ladies has a head injury tended by team-mates Robyn Gribble and Emma Faux during the 10-1 win against Colchester. Photo: David Lowndes. A scintillating first-half display set City of Peterborough Ladies up for a 10-1 East Division One North win over Colchester at Bretton Gate yesterday (February 5). City were an astonishing 8-0 up at the interval against mid-table opposition, a team who had beaten City 5-2 in the reverse fixture earlier this season! Anna Faux (red) in action for City of Peterborough Ladies during the 10-1 win over Colchester at Bretton Gate. Photo: David Lowndes. Emma Faux opened the scoring from a short corner after five minutes. she added another from another penalty corner on eight minutes before Jeorgia Carr made it 3-0 after just 11 minutes. 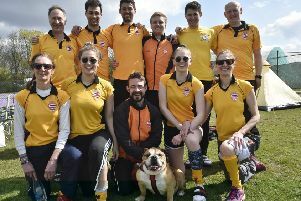 Faux completed her hat-trick before the interval, while Tierney Augustine (2) and Carr (again) also netted before the visitors could reach the sanctuary of half-time. Carr, who was named player-of-the-match, completed her hat-trick after Anna Faux had also scored. In between those goals Colchester scored their consolation goal. City have now strengthened their grip on second place ahead of next Saturday’s (February 11) trip to bottom club Bury St Edmunds. Two-goal Tierney Augustine on the ball for City of Peterborough Ladies against Colchester. Photo: David Lowndes.